Forcing bulbs in winter is easy to do and helps bring a bit of spring to your home early. This is a guide about forcing bulbs in winter. 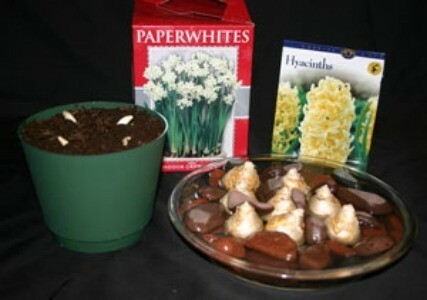 Here is what I do with my paper white narcissus bulbs that many of us love to grow indoors at Christmas. Put some marbles and the bulbs in the bottom of a tall clear glass vase. When they begin to grow and flower (with the most wonderful smells), the tall glass vase will keep them from toppling over like they do when planted in a shallow dish. Enjoy! Nothing beats a pot of brightly colored flowers in the middle of the winter blues. Although October is typically the month when gardeners pot bulbs for forcing winter blooms, if you didn't, don't worry, it's not too late. Plant a variety of bulbs right now and you could be blooming from ear to ear just in time for Valentine's Day. Before running out and snatching up all the deeply discounted left-over bulbs, you need to know that not all bulbs can be successfully forced early. The best quality bulbs will give you the best quality blooms. Choose large, firm, even colored bulbs and avoid those with nicks and cuts, soft spots or mold. Consult with your neighborhood nursery to find out which varieties are best suited for forcing. Bulbs should be planted in clean, sterile pots. As long as it has drainage, almost any container will do. Use a loose mixture of 1 part potting soil, 2 parts peat moss and 1 part sand and don't press them into the soil. Bulbs should be placed closely together in the pot, flat side down, and covered so only their tips are exposed. Water them thoroughly after planting and don't let them dry out. Planting mixed varieties in the same pot will give you mixed results, so try to plant bulbs with the same bloom times in the same pot. If the bulbs you planted need a cold treatment before flowering, mark ahead on the calendar when you can begin bringing them out of storage. For continuous blooms throughout the winter, stagger the pots as you take them out of storage by a week or two. Hyacinths and crocuses can also be forced in water. Special vases are made for them that hold the bulb in the upper portion and water in the lower portion. The bulbs are placed in a cool (50 degrees F), dark location for up to eight weeks until a root system is established and the shoots emerge. The vase can then be placed into a sunny window for flowering. Some bulbs need time to "chill out" before they can be stimulated for growth. These typically include the types of bulbs planted in the fall: hyacinth, tulips, crocus, non-tropical narcissus (daffodils), scillias and lily of the valley. After planting, these bulbs should be kept in temperatures from 35-48 degrees for a period from 12-18 weeks, depending on the variety (see table below). Bulbs can be chilled longer than necessary without being harmed but if they are not chilled long enough, they may not be able to flower. If you live in a very cold climate, you can keep the pots outdoors, but they should never be allowed to freeze. In northern zones, bulbs stored outdoors should be covered with 10 inches of soil, followed by 10 inches of mulch. Cover the area with mesh or boards to prevent rodents from stealing your bulbs. For indoor storage, attics, crawl spaces and cold basements usually work well. You can also store them covered in the refrigerator, but make sure they are kept clear of produce (some types of produce release gases that will damage bulbs) and give them a few air holes to breathe. After bulbs have been chilled the required amount of time, gradually move them into warmer temperatures to stimulate growth. Start with temperatures of 60 degrees F in locations out of direct sunlight. When emerging shoots reach 4-5 inches in height, they are ready to be moved to brighter light and temperatures of 68-70 degrees F. When plants start to flower, move them back into areas of indirect sunlight to mimic the less intense sunlight of spring. Some spring blooming bulbs don't need a cold treatment before blooming. These include, amaryllis, freesia and paper whites (tropical narcissus). 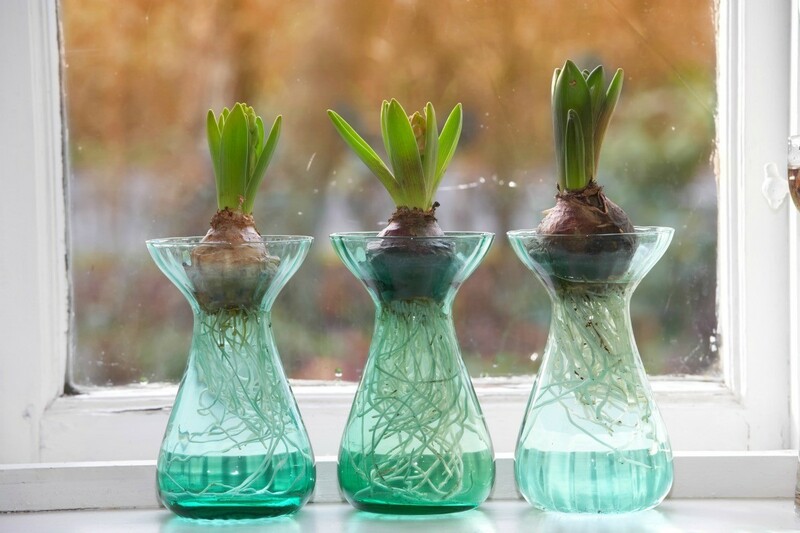 Pot these bulbs the same way, but skip the cold treatment. These bulbs can also be forced in water, by placing them in a shallow pan filled with water and anchoring bulbs with crushed rocks or pebbles. Fill the pan enough to cover the basil plate (1/4 to 1/3 of the bulb). You should see sprouts in 1-2 weeks. Keep plants cooler (50 degrees F) and out of direct sunlight for the first two weeks. Then move them into a warmer location with direct sunlight for flowering. Plan now for your holiday bulb display. You can have a dishful of paper whites a bloom in as little as four weeks. Dig up bulbs now for forcing during the winter. Put them in the refrigerator for about a month. Then plant them in pots and let them grow. Then they will be ready to plant for flowers at Christmas time. My wife put together several glass vases with pebbles to grow bulbs in (tulips, daffodils, crocus, and Dutch iris). They started out well, got to the point where the flowers were about to open, then things went south. Mold started growing on the bulbs, the water became cloudy and stunk, no matter how much we changed the water it went bad in a couple of days. She has now transferred the bulbs to soil filled pots. I really liked the look of the pebble filled vases with the bulbs showing, but can't stand the smell and they were probably going to die. How is this done without the water going bad? The water has to be changed daily from the first day. How often should an aspirational n be added to the water? Is that what would have caused my bulbs to mold? So far, Ive thrown 3 bulbs, but it seems to be spreading.